CoilyQueens™ : Single Strand Knots! You can prevent single strand knots from forming! 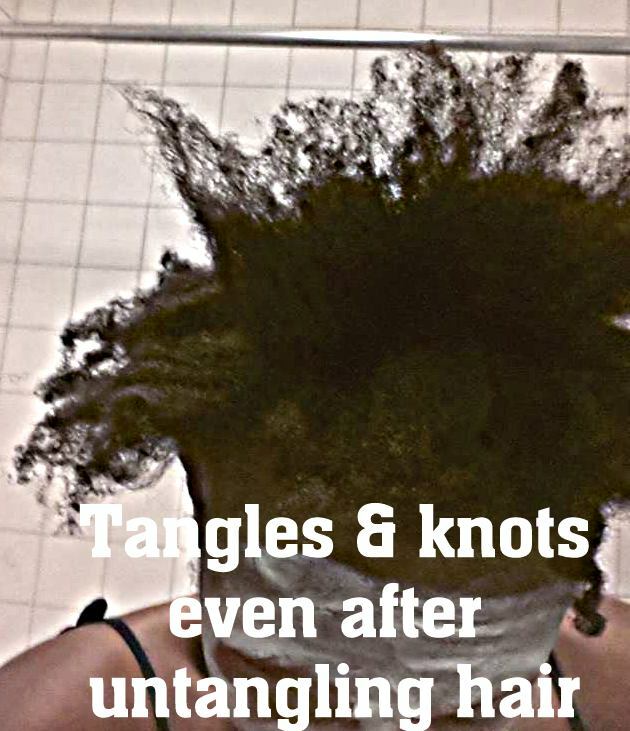 If you are natural, stretching your relaxer or transitioning from relaxed to natural, then more likely than not you are dealing with tangles, these tangles lead to single strand knots. Now I have seen many natural gurus say that tightly coily hair or type 4 hair is just prone to tangles and knots. That is just the nature of tightly coily hair. That is not true! Tangles and knots are the result of dehydrated hair. If you hair continues to be lacking moisture, then that hair will eventually snap and pop. That being true, the CoilyQueens Regimen, when followed on a regular basis, will eliminate your single strand knots and greatly reduce the amount of tangles you get. Just because your hair is tightly coily does not mean you have to deal with excess tangles and single strand knots. The CoilyQueens Regimen uses hydration and lubrication to eliminate your single strand knots and reduce your tangles. As you can see with my tightly coily long hair one would think I deal with lots of tangles and single strand knots. But thanks to the CoilyQueens method my tangles have decreased and I rarely get a single strand knot. When I do, it is because I forgot to cover my hair at night. So what is the secret to preventing single strand knots??? You apply a natural penetrating oil to your hair daily. Start with 1 tablespoon and massage oil onto your scalp first. Massage for 10 minutes to stimulate better hair growth. When massage is done, smooth the oil throughout the length of you hair strands. That is it! Good-bye single strand knots after 7 days of oil therapy. Healthy lubricated hair handled properly does not get single strand knots. Dry hair gets single strand knots and tangles easily. This regimen makes your wash day shorter because there is no need to pre-poo. You lubricated hair is easy to untangle on shampoo day. Oil therapy the solution to single strand knots was discovered by CoilyQueensRock.com. This is the only website you will see promote this solution for single strand knots. I discovered this while experimenting with my love of natural oils, so if you read this solution anywhere else they copied me and should give CoilyQueensRock.com credit. The CoilyQueens Regimen greatly decreases your tangles when you practice oiling daily as recommended. I have followed this regimen for 3 years and my hair rarely gets a single strand knots because I have fewer tangles. If I do get a knot it is easy to untangle with no damage, because my hair is well lubricated and strong. Try the CoilyQueens Regimen today you will not regret it! This regimen is great for transitioners also, although I am mostly natural, as you can see from the above picture my bang area has some relaxer on it. About 4 years ago I was wearing a curly sew in so I relaxed the bang area of my hair so it could blend in. I am so glad I did not relax my entire head. I have to give this small area of hair, extra care because of the two textures. The CoilyQueens Regimen makes it easy to untangle when I do get tangles. Because of the lubrication, I can easily pull them apart with my fingers. I do not have to resort to cutting the knots out. Some might say well, why not just cut your bangs. Well this picture was taken in 2011, so I have cut a small part of my bangs, but I still have some left because it was a large bang. Also because I took care of it so well, I experienced no breakage, you can tell from the picture how healthy it still looks regardless of the relaxer still being there. So because it has not interfered with my daily styling and it is not breaking, I chose not to cut it. The CoilyQueens Regimen has enabled me to not have breakage. This will work out great for long term transitioners. Start the CoilyQueens Regimen today! Also read about my adventures in oiling and how I discovered this wonderful benefits, oil therapy provides. Can the penetrating oil be mixed with another oil?